Alarm bells rang loudly upon discovering Delays were to postpone or rather reschedule last years tour. Was there trouble in the Delays camp? Musical difference's or record label wrangles? Thankfully my suspicions were unfounded. Delays are perfectionists through and through and felt time was needed on the follow up to their debut album "Faded Seaside Glamour", the fruits of their labour will be released in a few weeks time on the simple titled "You See Colours". An enthusiastic greeting from the die hard Delays contingent, many of whom have waited patiently for the return of Southamptons finest. 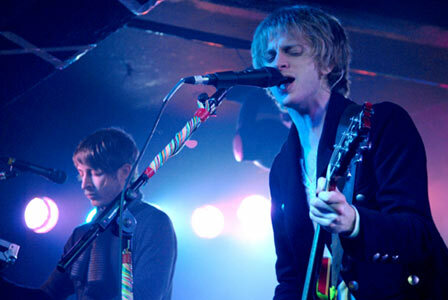 Bleach blond guitarist lead singer Greg Gilbert is glad to be back playing live with his bandmates after so long locked away in the studio and from the very first note it's obvious Delays are back better than ever before. Still able to knock out a classy tune with effortless ease Delays have an ace up their sleeves. Yes, the search may not have been easy but Delays have found the funk and it suits their new direction to the ground. "Lost In A Melody" has the fans next to me singing it word for word as the unorthodox keyboard player gives the crowd one of his now legendary cheeky winks. The strobes add an extra dimension to the drama happening on stage as Delays put on a show stopping performance. "Never Alone" and former single "Long Time Coming" have an indie credibility with choruses and melodies which Lee Mavers from the La's would surely give his seal of approval to. Dance, techno and the aforementioned funk all have a part to play in the wall of sound Delays are creating now. Greg is left on his own while he performs "Bedroom Scene" in a nakedly honest solo rendition. "Given Time" off their new album has a bass line worthy of the Police (Ed: This isn't a good thing surely Nick) and is a confident, well crafted song with some extremely pleasing guitar work which is an immediate winner with the fans. Recent hit single "Valentine" sees Greg coming over all Jimmy Sommerville with his pitch perfect falsetto to a seductively decadent disco beat which wouldn't sound out of place blasting the speakers in New York's once cool hotspot Studio 54. Read our review of the Delays first tour with The Ordinary Boys - Click Here!! !